« Unusual tips in PTMC : How to cross a critically narrowed mitral orifice ? 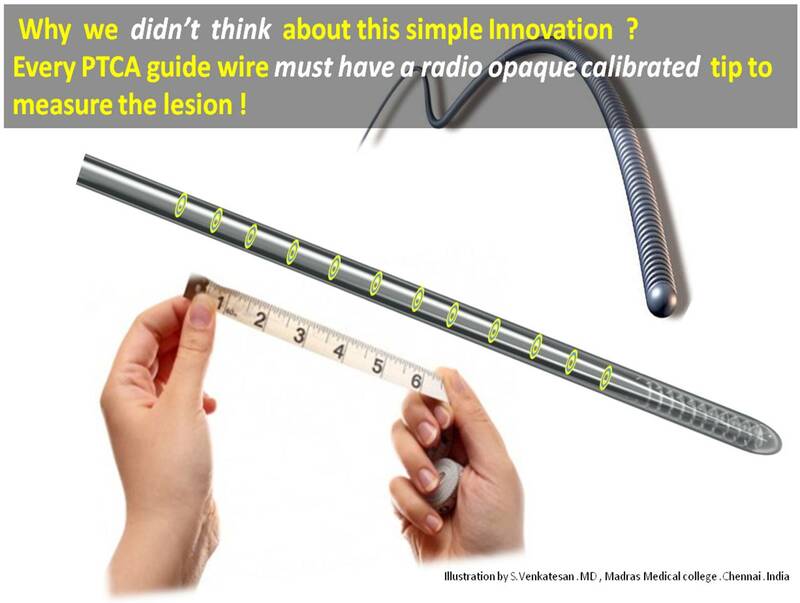 Calibrated PTCA guidewires : A simple Innovation can make cardiologist life lot easier ! It is estimated nearly half a million PCIs are done all over the globe every year .Evaluating diagnostic angiogram is a critical vital step, but often times it is given less time and left to fellows .This is done mostly offline by Image processing software. Curiously , lesion assessment becomes a causality to the visual acuity .It ends up with lot of whims , intuition and bloated egos of senior cardiologists ! Reference catheter may be far away in the Aorta , and confer a magnification error . This becomes important especially in ostial lesions and associated major branch lesions. The computer uses the edge detection algorithm which carries an inherent error . Always on . Repeatedly used in multiple views . The end on view is effectively nullified . Magnification factor do not operate. Finally , and most importantly in complex tortuous , tandem lesions few mm errors can be disastrous .These calibrated guide wires will make our life lot easier. Measuring a coronary lesion remains a delicate issue . If only we have radio opaque rings every 1mm or so in the distal end of the guide wire , we can measure the lesion instantly and most accurately. I do not know whether any of the existing guide wires have this facility . (I guess it is not . . .then , let this idea be patented in my name !) After all , It is a mean task for all those mighty coronary hardware companies to add few radio opaque rings to all PTCA guide wires! Medtronic, Abbot, Boston are you listening ? And . . . your opinion please !